Oops... sorry. Long link was truncated. I have always heard Costco gets good press, reviews and that people familiar with them are very loyal. People on the coasts and large urban areas have grown up with Costco while people in other areas have never head of them. Costco is FINALLY making their way to mid-west urban centers, but some in smaller mid-west cities still don't know what a Costco or BJ's is - while Sams has been around for decades. So opinions on Costco buying experience are likely to be regional. ; ) - many mid-westerners think East and West coasters are oblivious about the existence of people sandwiched between the two coasts. I know there is a samsclub.com, maybe there is a costco.com? - but I would suspect that in most cases, Amazon would be ahead of that wholesale pack. @Basset - I was a Costco member for years but I let my membership lapse because it was so frustrating shopping there. We sometimes waited for an hour in line just to pay for our stuff. I know years ago you had to have "connections" to get to be a member, but it now appears anyone can join (saw that on costco.com which does exist). The main targeted Amazon Prime Customer is an entirely different animal than any Walmart customer. If that is not understood, then one should not bother doing Amazon FBA as a seller. A few years ago we moved near a Costco for the first time ever and joined out of curiosity, but only used it once - We wasted membership fees to buy a pound of cheese, sun dried tomatoes and a tub of pesto. And never went back! Too congested. We DID like the fact that we did not have to stand in line (like Sams) to have an employee make a magic marker mark on our receipt in order to leave the store. Guess not - I haven't had to bail him out yet. Compared to congested big membership clubs fee wise, it looks like heavy users might get more bang for the buck with an Amazon Prime membership, especially if they also sell on Amazon. If you're self-employed, shop in the morning. It's super easy to get a Sam's Club business membership with exclusive early hours (and free breakfast!). This morning there were multiple open self-checkouts at both Walmart and Sams. Yes, you still have to have your receipt checked (twice for self-checkout) at Sams. Wal-Mart is actually the only online store that beats Amazon in sales year after year. This could hurt Amazon especially if Wal-Mart starts doing more and taking better care of 3rd party sellers than Amazon. Wal-Mart and Amazon have the variety of goods they have because of 3rd party sellers. Amazons prime works like it does because of FBA, which they continue to raise prices on. Unlike Amazon, Wal-Mart has warehouses literally all over the world because they have stores in pretty much every city in the US and throughout the world. If I were Amazon, I would be worried. Those who diss Wal-Mart because of their cheap china goods need to realize that Amazon is also filled with the same china goods. All Wal-Mart has to do is increase their 3rd party sellers and open up their own FBWM (FBA for Amazon) and Amazon will be in SERIOUS hurt. Amazon has enjoyed it's status because there has been no one big enough to truly compete with them who also has the infrastructure in place to execute it big enough and fast enough, except for Wal-Mart. Wal-Mart does not just have the power and money to compete with Amazon, they have enough of both to SMASH Amazon. However, Amazon has at this moment a clear ADVANTAGE over Wal-Mart that can prevent them from being crushed by Wal-Mart and that is a much larger and DIVERSE 3rd party seller base. This is why Amazon has many items that cannot be found on Wal-Mart.com or in the stores. 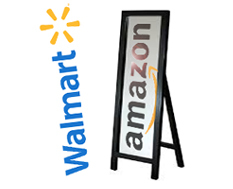 Wal-Mart focuses more on chain store and large vendor type items which limits the type of items, as where Amazon has a much broader scope of sellers and items giving them a much better advantage and larger variety of customers. They also have much higher end type of products as well as the cheaper ones. If Wal-Mart opens up their horizons of sellers and items and offers more to the sellers both FBA type and individually for coming over to them, Amazon will LOSE the only advantage it has over Wal-Mart. If I were Amazon, I would start wooing my sellers ASAP. Just like Amazon has no real or true love for their sellers, their sellers have no real or true love for Amazon. There are several issues Amazon has that hurt their sellers that they have ignored for a long time, and many of these sellers have already been beaten down by ebay for a number of years (such as myself) and if Wal-Mart comes in and promises them the protections Amazon isn't giving them and they can make as much and probably much more with Wal-Mart, you will see a mass exodus from Amazon to Wal-Mart. Although I think most sellers will try out both venues before making a full move. I know I would. I personally would prefer to stay on Amazon but I am seeing Amazon turn into ebay in many ways especially with the buyer fraud and abuse going unchecked and unstopped. The BAD ebay buyers are now flooding Amazon and it shows big time. Also, by the time ebay could see past it's ego to see just how much of a threat Amazon was to it, it was too late. If Amazon does the same with Wal-Mart, it too could be too late for it as well. Another thing Wal-Mart does not have against it is a reputation of STEALING from it's own sellers. Amazon has a horrible reputation of stealing from it's own sellers. When sellers have products that sell well, Amazon goes in and starts selling them and they not only sell them but even when they charge MORE for the items, they BURY the sellers lower cost items and place their HIGHER cost items in it's place. Amazon also allows sellers to STEAL pictures, descriptions etc from other sellers. This infuriates sellers like myself and is why I do NOT put all of my items on Amazon. I do not work hard on my picture layouts, descriptions and buy my own UPC codes so others can just come and STEAL them with complete immunity by Amazon. I have listings literally completely stolen from me by FBA members and other sellers with higher feedback than me. Some of them I completely stopped selling on Amazon but am FORCED to have them still in my store where people click on them and leave my store to go to my competitors, and another one where I ONLY sell the item when the FBA member sells out, and I am stuck with their GOD UGLY picture of the item Amazon replaced with theirs displaying as if it is mine. This is also the type of crap I am tired of dealing with with Amazon. The more I think about it, I am heading over to Wal-Mart.com right now to check it out. HAHAHA!! Walmart is having flunky problems to try to match up with Amazon. This will be actually fun to watch to see what really happens with this! ''The service was originally scheduled to launch last year before the holidays, but had to delay the launch over ''technical and other issues.'' '' BWAHAHAHAHAHAAHAAA!! sounds like a flunky situation already. Walmart will fail and their JUNK will cost too much for returns if Wal Mart is going to pay return shipping on their defective Junk!! I Predict an epic fail to Wal-Mart.. I have an Amazon prime membership but hardly use it and will not be re enlisting when it comes due. The way I have learned to shop is by googling what I want. Several times but not always Wal-mart came out cheaper than Amazon. Shipped to my home. That was including local Sales tax as Walmart has a presence everywhere. I am not a big fan of Walmart and not a real big fan of Amazon. Walmart will study Amazon like they studied mom and pops and drive them into the ground. If you stop and think Walmart already has way more "fullfillment centers" around the country than Amazon to supply their store. Why not ship as they can do it reasonably from many locations. As far as Walmart selling junk and Amazon selling the good stuff is just wrong. They both sell junk. I have a list of junk I bought off Amazon . Did you every read reviews on Amazon. Many one star items. One other thing . Walmart is making money. Amazon is still promising to make money . Stock price on Walmart is real profit. Stock price on Amazon is what might be our profit. Amazon earning does not impress me for as long as they have been around. Walmart and Amazon will be a major battle for the next couple of decades. The lowest cost producer always wins long term. The cost of getting products to the customer from the Amazon warehouse is huge. The Big superstore with millions of skus within reach of the customer will work long term. Amazon must learn to make money someday soon. Walmart learned that early on and has mastered making money---Amazon is still just an overhyped online business.